1-/3-Phase 1000A True RMS AC Power Clamp Meter. Multifunction Meter with Built-In Non-Contact Voltage Detector. 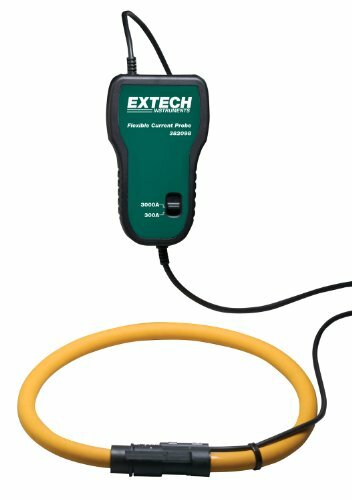 Extech's multifunctional PQ2071 Power Clamp meter operates as a True RMS Clamp Meter, Power Meter, Multimeter, and AC Voltage Detector. Featuring a CAT IV-600V safety rating, the PQ2071 measures AC Current, Voltage, Frequency and Power including True Power, Apparent Power, Reactive Power and Active Power. Measures 1-Phase and balanced 3-Phase True Power (kW), Apparent Power (kVA), Reactive Power (kVAR) and Active Power (kWh), plus Power Factor and Phase Angle. 2.16" (55mm) clamp jaw opening. Large dual backlit LCD display (9999 count) with bargraph. Frequency measurement to 200Hz. Manually store/recall up to 99 data sets. Data Hold, Max/Min, and Auto power off functions. USB interface for connection to a PC for datalogging function with included software. Complete with test leads, four color-coded leads and alligator clips, USB cable, PC software, 9V battery, and soft case. View larger 1200A 3-Phase Power Analyzer/Datalogger 3-Phase Power Analyzer/Datalogger saves data (up to 30,000 sets of measurements) on an SD card in Excel format for easy transfer to your PC. It provides full system analysis with up to 35 parameters including: V (phase-to-phase), V (phase-to-ground) - A (phase-to-ground), KW / KVA / KVAR / PF (phase), KW / KVA / KVAR / PF (system), KWH / KVAH / KVARH / PFH (system), and Phase Angle. Readings are displayed on a large, dot matrix, sun-readable, backlit LCD. Applications AC Power Quality Evaluation Motor/Generator Installation Energy Audits Other Features High accuracy autoranging current clamps (0.2A to 1200A), 600VAC input with CAT III-600V safety rating , adjustable Current Transformer (CT) and Potential Transformer (PT) ratio for high power distribution, wide sampling rate range (2 seconds to 2 hours, and an easy-to-use onscreen menu. Includes Comes with three current clamps, four voltage leads with alligator clips, eight AA batteries, SD memory card, Universal AC adapter (100 to 240V), case, and user manual. 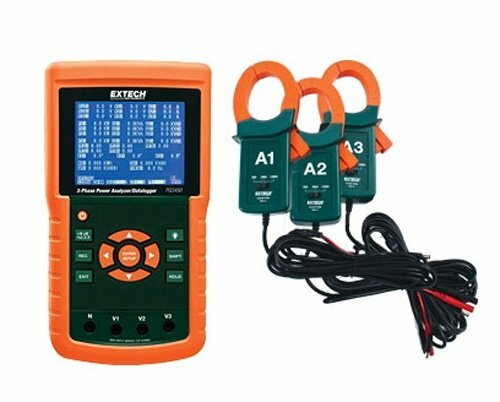 Extech 380940 True RMS 400A AC/DC Watt Clamp-on; Measures Watts, Current, and Voltage with AC/DC True Power measurements to 240kW; Large 4000 count LCD display The compact Extech 380940 is a 400 Amp mini True RMS AC/DC power clamp meter with a small diameter jaw designed to reach in small areas while providing power calculations up to 240kW. With the added convenience of instant watt readings, a feature normally reserved for full-size meters, this mini power clamp is useful for essential troubleshooting tasks in plant maintenance, electrical, HVAC, and telecom work, as well as residential electrical repairs, energy audits, fleet maintenance, marine, and motorcycle repair. Complete with test leads, 2 AA batteries, and carrying case. View larger Appliance Tester/Power Analyzer Model 380803 Appliance Tester/Power Analyzer is a compact battery operated device for analyzing AC power loads. Plug the device to be tested directly into the Power Analyzer. It will provide four simultaneous displays of Watts (200, 2000W), Power Factor (0 to 1.00), Voltage (200, 750V) or Frequency (40Hz to 20kHz), and Current (20A/terminals, 15A/sockets). Applications Measure and Audit power consumption of single-phase devices Evaluate load performance under varying line conditions Demonstrate effectiveness of power conservation efforts Characterize device AC power requirements Other Features This device has a built-in datalogger that stores up to 1,012 readings (single record or continuous) that can be downloaded to a PC for further analysis using the included software and cable. Additional features include Data Hold, Max Hold, and overload protection. Battery or AC adapter operation provides line isolation. Includes Comes complete with Windows compatible software, cable, eight AA batteries, power cord, AC Adaptor, case, and user manual. Also available with a NIST Certificate of Calibration (Model 380803-NIST). 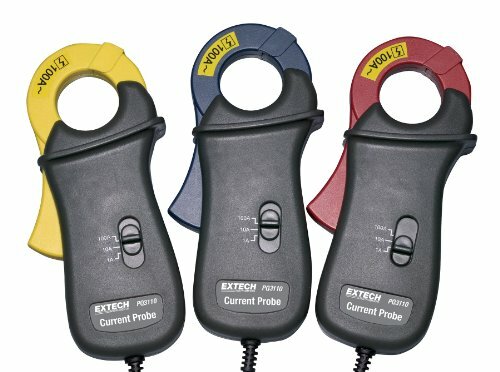 1200A Current Clamp Probes (set of 3) for PQ3450/PQ3470 Analyzers. 2" (50mm) jaw size. 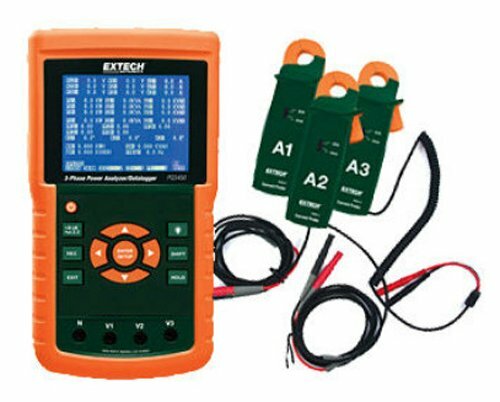 Powerful Power Quality Testing The Extech 380976-K is a Single Phase/Three Phase 1000A AC Power Clamp Meter Kit that combines comprehensive power quality testing along with expanded clamp meter capabilities. Along with surges and dips in a plant s main power supplies, infrastructure factors such as aging lines can affect power quality. And as the prevalence of smart metering systems in manufacturing sites increases, expect to see increased effects on power quality. In addition, power quality should be evaluated and optimized during gen-set installation and maintenance. Advanced Functionality Use the full-size Extech to measure Current, Insulation Resistance, Temperature (Type K) and Power. For example, in trying to determine if there is dirty power in one branch supply, you can measure for True Power (kW), Apparent Power (kVA), and Reactive Power (kVAR), not to mention Horsepower (HP), Power Factor, and Phase Angle with Lead/Lag indicator. The large 9,999-count readout is easy to read while performing a range of functions on this comprehensive power clamp meter. 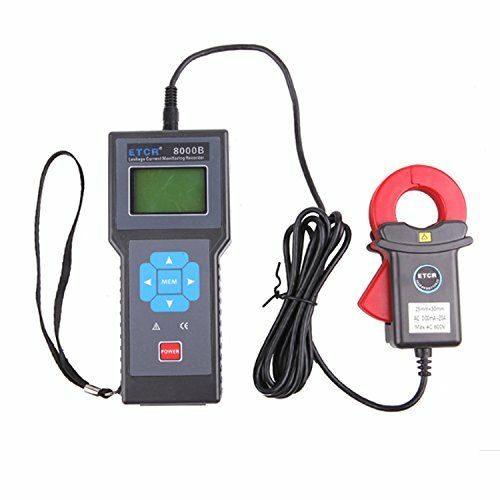 In addition to power quality functions, the True RMS clamp meter also measures AC current and AC/DC voltage, resistance, frequency and temperature. In fact, frequency can be displayed simultaneously with voltage. Other Features If you perform maintenance on heating systems or industrial heat process equipment, you can take advantage of A current readings with 10nA resolution for flame rod tests. Capacitance testing can be performed up to 7000 F with 0.001 F resolution. Investigate resistance issues with a rating up to 100M and temperatures up to temperature to 1000 F using the included thermocouple bead wire probe. The useful Data Hold function freezes the display while the Min/Max function tracks and displays minimum and maximum values even tracking with elapsed time. 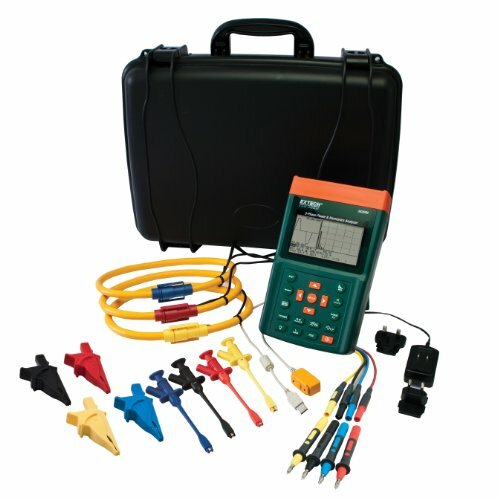 The 380976-K kit comes with a professional set of test lead accessories to simplify a range of testing scenarios: two CAT IV-600V 72" (1.8m) lead extensions with right angle and straight end shrouded banana plugs; two modular test probe handles with stainless steel tips; two plunger activated retractable jaw clips; and two extra large alligator clips. Measuring 9 x 3 x 1.6" (H x W x D), the CAT III-rated meter also includes 9V battery, thermocouple bead wire probe, carrying case, and user manual. NIST certification is also available on the meter. 3-Phase Graphical Power & Harmonics Analyzer/Datalogger saves up to 30,000 readings on an SD card in Excel format for easy transfer to a PC for analysis. It features a large dot-matrix, sun-readable, graphical, backlit LCD with full system analysis of up to 35 parameters including: V (phase-to-phase), V (phase-to-ground), A (phase-to-ground), KW / KVA / KVAR / PF (phase), KW / KVA / KVAR / PF (system), KWH / KVAH / KVARH / PFH (system), and Phase angle. Additional features include Adjustable Current Transformer CT (1 to 600) and Potential Transformer PT (1 to 1000) ratio for high power distribution systems, on-screen Harmonics display (1 to 50th order), simultaneous display of Harmonics and Waveform, display of Waveform with peak values, analysis of Total Harmonic Distortion (THD), Graphic Phase diagram with 3-Phase system parameters, 3-phase Voltage or Current Unbalanced Ratio (VUR, AUR) and unbalanced factor, a wide sampling rate from 2 seconds to 2 hours, a built-in Clock and Calendar, and an easy-to-use onscreen menu. You can also capture Transient events (including dip, swell, and outage) with programmable threshold (%). 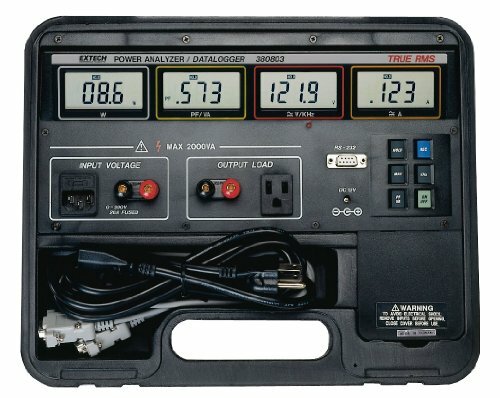 Meter comes complete with 4 voltage leads with alligator clips, 8 AA batteries, SD memory card, Universal AC adaptor (100 to 240V), and case. Clamp probes sold separately. Choose the best clamp probes to fit your application needs ranging from 200A to 3000A and flexible vs traditional jaw type. 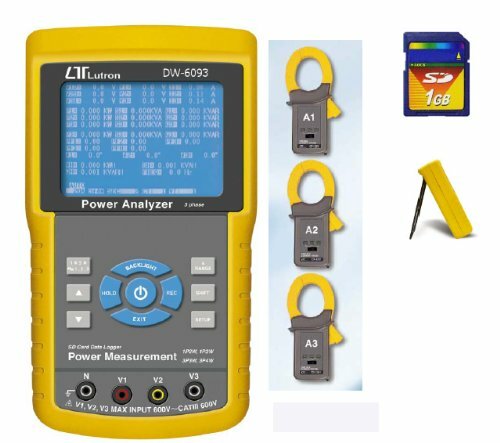 Datalogging Power Analyzer (up to 30,000 sets of measurements). Large dot-matrix, sun-readable, numerical, backlit LCD with easy-to-use onscreen menu. Full system analysis with up to 35 parameters. V (phase-to-phase), V (phase-to-ground). A (phase-to-ground). KW / KVA / KVAR / PF (phase). KW / KVA / KVAR / PF (system). KWH / KVAH / KVARH / PFH (system). Phase angle. Optional 200A, 1200A Current Clamps or 3000A Flexible Current Probes. Adjustable Current Transformer CT (1 to 600) and Potential Transformer PT (1 to 1000) ratio for high power distribution systems. Log up to 30,000 reading on a removable SD memory card in Microsoft Excel format. Wide sampling rate range (2 seconds to 2 hours). Built-in Clock and Calendar. 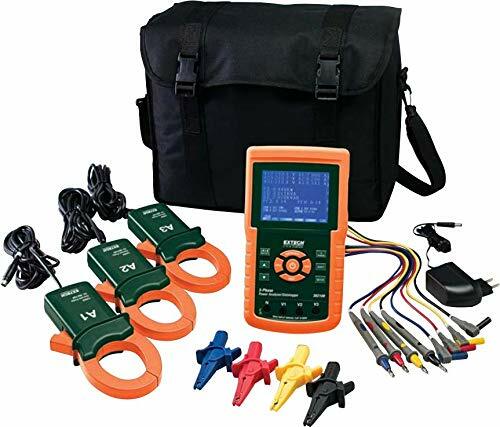 Extech 382075 True RMS 2000A AC/DC 3-Phase Clamp-on Power Analyzer, 4-Digit 9999 count dual display LCD, Clamp jaws open to 2.2" (55mm) for 1000MCM conductors, Measures True Power (AC, DC) The 382075 is a 3-Phase TRMS Clamp-on power analyzer which can be used on 3- and 4-wire balanced or unbalanced loads. It can measure reactive and apparent power to 1200kW. Additional measurements include: watts, voltage, current, frequency, power factor and phase angle. It can display lead, lag current and voltage phase shift in degrees and store/recall the last 4 readings. Features include: DC current auto zero, data hold, min/max, and relative mode. Comes complete with test leads, carrying case, and 9 Volt battery. 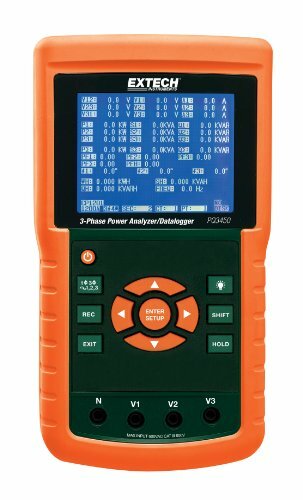 1200A Datalogging Power Analyzer (up to 30,000 sets of measurements). Large dot-matrix, sun-readable, numerical, backlit LCD with easy-to-use onscreen menu. Full system analysis with up to 35 parameters. V (phase-to-phase), V (phase-to-ground). A (phase-to-ground). KW / KVA / KVAR / PF (phase). KW / KVA / KVAR / PF (system). KWH / KVAH / KVARH / PFH (system). Phase angle. Includes 1200A Current Clamps; Optional 200A Current Clamps or 3000A Flexible Current Probes. Adjustable Current Transformer CT (1 to 600) and Potential Transformer PT (1 to 1000) ratio for high power distribution systems. Log up to 30,000 reading on a removable SD memory card in Microsoft Excel format. Wide sampling rate range (2 seconds to 2 hours). Built-in Clock and Calendar. 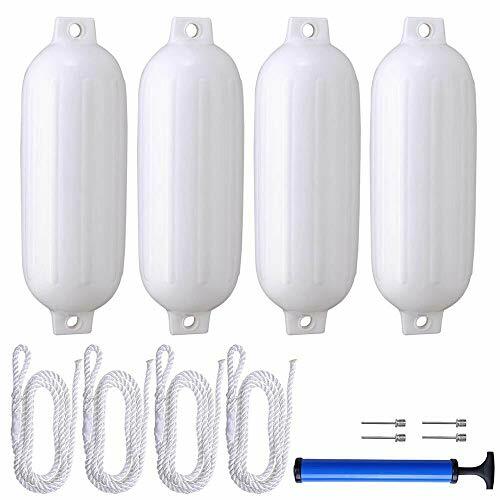 Durable, its lifespan can up to 5 years under normal use Easy installation, ideal for ships, boats, docks, etc. 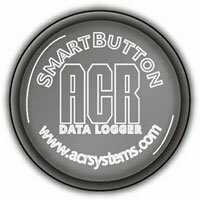 The ACR SmartButton Data Logger Measures and Records Temperature. 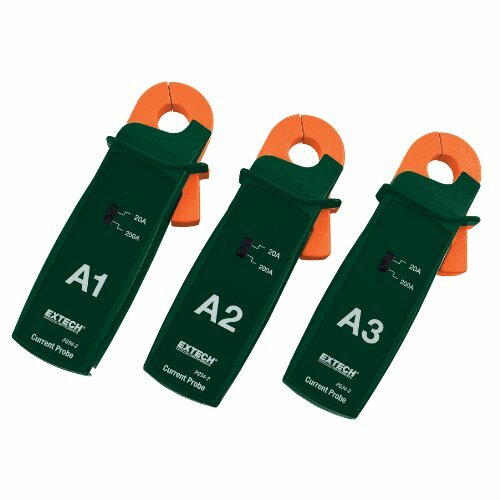 The button-size provides a lot of flexibility for locating the data logger in small areas. The smartbutton stores 2,048 temperature readings internally before using the included USB Cable to download the recorded data to a PC for analysis. The ACRSB features a 1 minute to 255 minute sampling rate, delay start and a battery life up to 10 years. Its internal sensor has a measurement range of -40C to 85C with an accuracy of 1.0C (-30C to 45C). The SmartButton Requires the TrendReader Software for SmartButton and the SmartButton USB Interface Cable for Configuration, Setup, Data Download and Analysis of Recorded Data. Apparent Power ( KVA,MVA,GVA ) measurement. Power Factor( PF ) Phase Angle( ). Current probe input signal volage (ACV):200 mV/300 mV/500 mV/1 V/2 V/3 V; Current probe input current range (ACA):20 A/200 A/2000 A ( 1200 A)/30 A/300A /3000 A.
Built-in clock and Calendar,real time data record with SD memory card,sampling time set from 2 to 7200 seconds. Just slot in the SD card into the computer,it can down load the all the measured value with the time information ( year/month/data/hour/mimute/second ) to the Excel directly,then user can make the further data analysis by themselves. The lead time is about 5 days. DHL shipping time is about 3 days. If any questions, please contact us via message. For more details, please contact us. We can send you detail data sheet. USB Cable(USB-01),RS232 cable(UPCB-02) and Data Acquisition Software are optional Accessories. 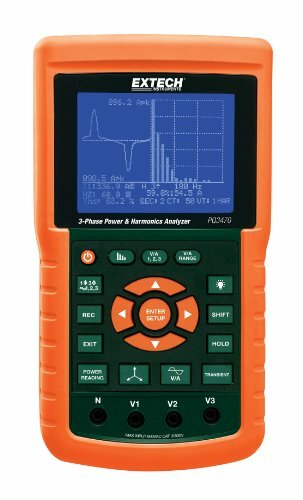 200A Datalogging Power Analyzer (up to 30,000 sets of measurements). Large dot-matrix, sun-readable, numerical, backlit LCD with easy-to-use onscreen menu. Full system analysis with up to 35 parameters. V (phase-to-phase), V (phase-to-ground). A (phase-to-ground). KW / KVA / KVAR / PF (phase). KW / KVA / KVAR / PF (system). KWH / KVAH / KVARH / PFH (system). Phase angle. 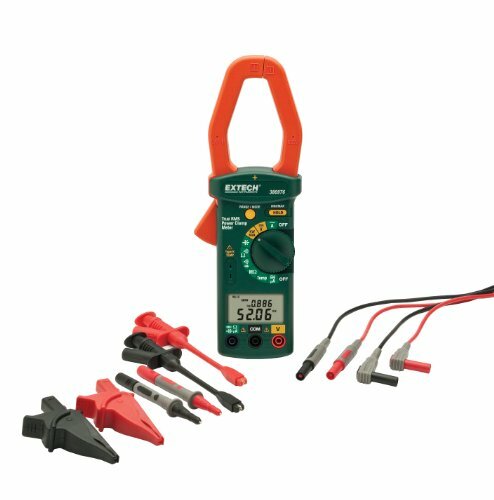 Includes 200A Current Clamps; Optional 1200A Current Clamps or 3000A Flexible Current Probes. Adjustable Current Transformer CT (1 to 600) and Potential Transformer PT (1 to 1000) ratio for high power distribution systems. Log up to 30,000 reading on a removable SD memory card in Microsoft Excel format. Wide sampling rate range (2 seconds to 2 hours). Built-in Clock and Calendar. 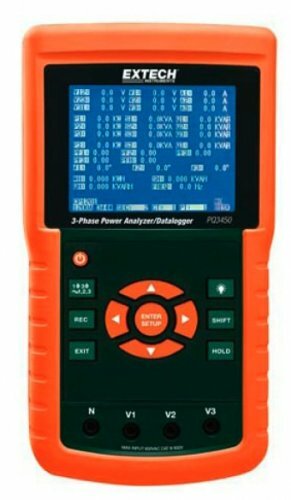 3000A Datalogging Power Analyzer (up to 30,000 sets of measurements). Large dot-matrix, sun-readable, numerical, backlit LCD with easy-to-use onscreen menu. Full system analysis with up to 35 parameters. V (phase-to-phase), V (phase-to-ground). A (phase-to-ground). KW / KVA / KVAR / PF (phase). KW / KVA / KVAR / PF (system). KWH / KVAH / KVARH / PFH (system). Phase angle. 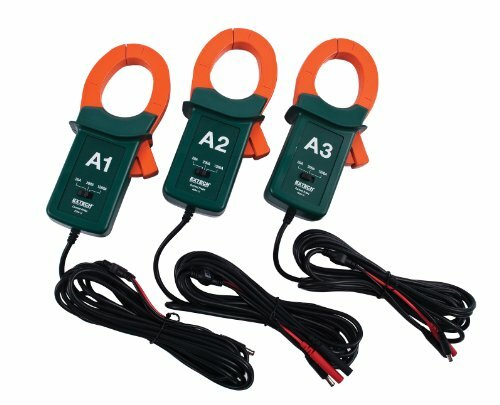 Includes 3000A Flexible Current Probes; Optional 200A or 1200A Current Clamps. Adjustable Current Transformer CT (1 to 600) and Potential Transformer PT (1 to 1000) ratio for high power distribution systems. Log up to 30,000 reading on a removable SD memory card in Microsoft Excel format. Wide sampling rate range (2 seconds to 2 hours). Built-in Clock and Calendar. 100A Clamp Probes (set of 3) for PQ3350 Analyzer. 1.2" (30mm) jaw size. Functions: Measuring AC leakage current and AC current of three channel, monitoring current in real-time manner, locating insulation faults and repairing electrical lines. Battery. Voltage: A Low-Battery symbol is displayed and the user should replace the battery with a new one when the battery voltage drops to 4.6V to 4.8V. In this case, the measured values are still accurate. ETCR8300B series Three-Channel Current/Leakage Monitoring Recorder is well designed and manufactured for online measurement, monitoring and recording of Three-Channel AC leakage / current at the same time. It is composed of a tester, monitoring software, current clamp and communication cable, etc. This instrument has been widely applied the 380/220 Power system. It can provide a safety and convenience measurement with accurate results. The instrument has a large LCD display with blue background and a large storage space. 3900 sets of data can be stored in the instrument. Three- channel current value can be display on the screen. In addition, the instrument can automatically store data at a interval, which is adjustable from 1 to 99 min. Monitoring software provides online and real-time monitoring and historical data inquiry. With the software developed by our technical department, the users can read, inquire, store, generate and print a fitting curve and report. The current clamp is made of a special alloy, adopts the latest CT technique and magnetic shielding technique and is not almost interfered by external magnetic field. This ensures high accuracy, high stability and high reliability of the values which are measured continuously.